There’s something refreshing about returning to good, old, broad physical comedy and farce. No jaded irony or hipster coolness impedes its sheer enjoyment; mad-dash energy and pure silliness carries the story along to its positive, if predictable, end. 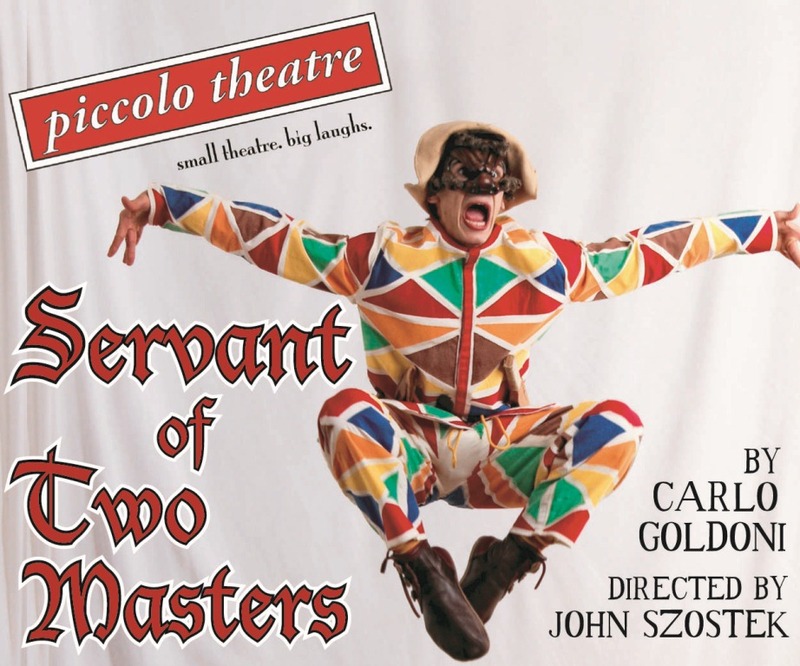 Piccolo Theatre does The Servant of Two Masters the old-style way, with all the traditional bells and whistles. 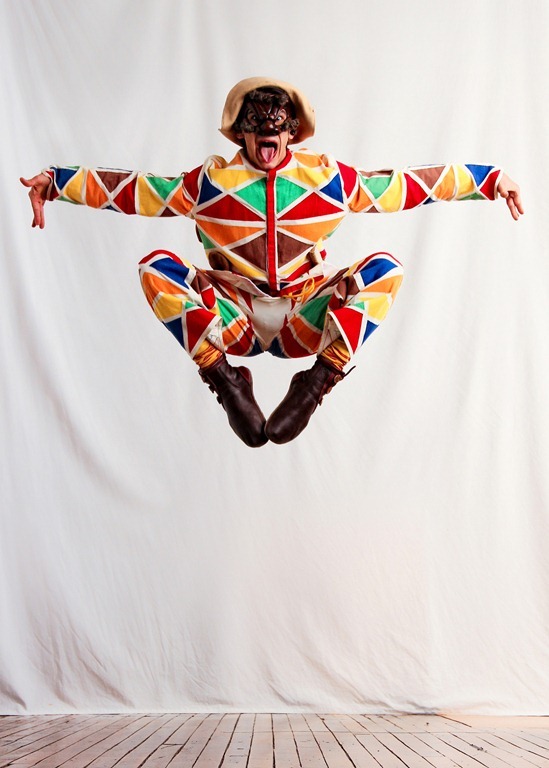 Take that literally, since benches line the wooden stage, loaded with noisemakers to amplify exaggerated gestures, body movement and wild slapstick typical of commedia dell’arte. 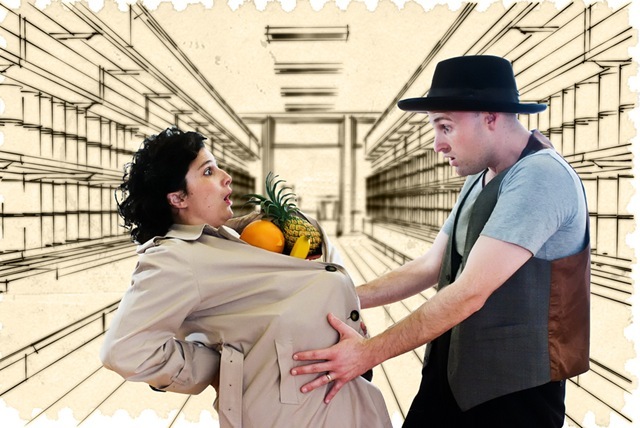 Under the tight direction of John Szostek, Piccolo is determined to give audiences as authentic and bawdy an old-world experience as possible, contrasting charming Italian song from the elegant innamorati (lovers) with the bawdy songs and acrobatic comedy of Truffaldino (Omen Sade). The entire cast acquits their roles with energetic teamwork and enthusiasm, which includes a certain improvisation with Carlo Goldoni’s text. Yet, none are put to the test like Sade–his put upon, wily servant is basically a non-stop cartoon through two vigorous acts. If there is anything to appreciate about Piccolo’s production, it’s the marathon of physical action the players go through for the audience’s enjoyment. Pantalone (Kevin Lucero Less) is about to marry off his daughter Clarice (Deborah Craft) to Silvio (Glenn Proud), the foppish son of Dottore Lombardi (Joel Thompson). But Truffaldino arrives to interrupt their engagement with news that his master, and Clarice’s original betrothed, waits downstairs. Actually, it is really Beatrice (Denita Linnertz) in men’s dress impersonating her brother, who was betrothed to Clarice before he lost his life in a duel with Beatrice’s lover, Florindo (Tommy Venuti). 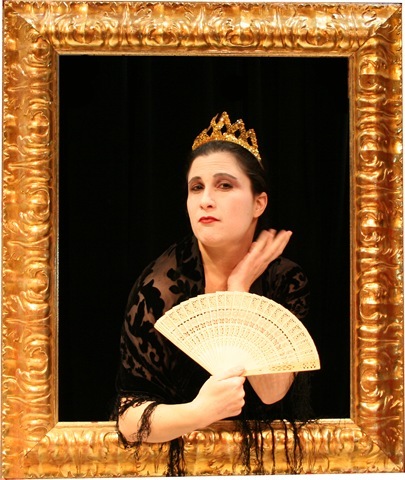 Disguised, Beatrice simply hopes to complete a business transaction with Pantalone so that she can use the money to find and assist her lover, who fled after the duel. Cross dressing is only one of the delights of The Servant of Two Masters; mistaken identity galore drives most of the plot as Truffaldino signs on to serving none other than—guess who–Florindo when he arrives in town. Piccolo’s production exults in these old formulas and executes them with verve. Szotsek has obviously encouraged a take-no-prisoners approach to the playing out the various dinner service sketches, swordfights (fight choreography David W. M. Kelch), and a boffo, knock-down-drag-out wrestling match between Pantalone and the Dottore. However, the production delivers charm as well as energy. 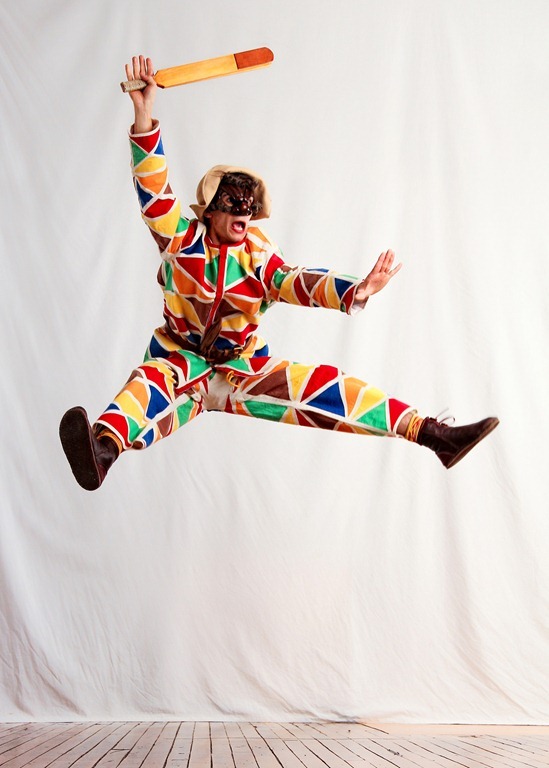 The simple pleasure of buffoonery – that is the hearty spectacle that Piccolo achieves in its economically tiny space. In doing so, they enliven a great tradition for future audiences. 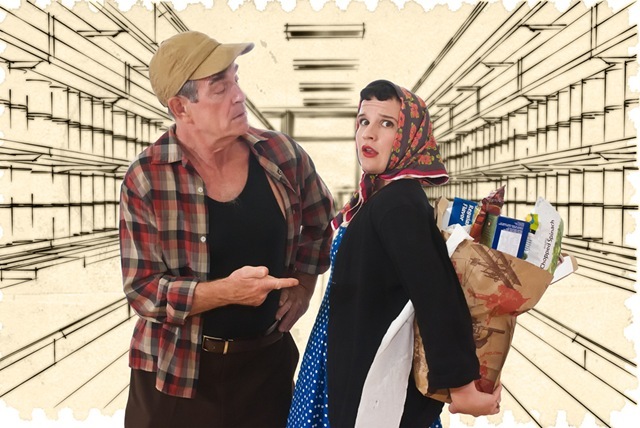 You’ve got to hand it to Piccolo Theatre for perennially bringing a bit of wacky English theater tradition to Evanston environs each holiday season. British Pantos are pure, unadulterated silliness. At Robin Hood: The Panto!, expect all the traditional British ribaldry—cheering the hero, booing the villain, and shouting, “He’s behind you!” when our hero is under sneak attack. The real fun of the show is witnessing full-on participation from a typically polite and respectful theater crowd. Oh—and the Dame (Andrew Roberts)—did I forget to mention that one must whistle and hoot every entrance made by the Dame? Shame on me! Whistle the Dame, everyone, or be known as real drag. 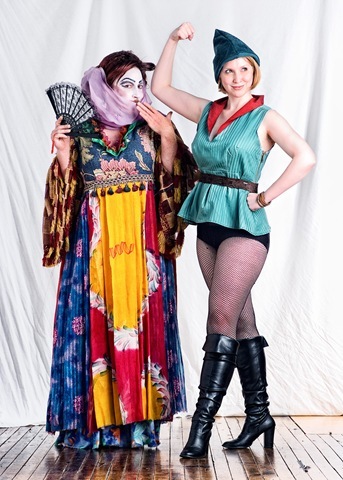 Co-directed by Glenn Proud and Brianna Sloane, Robin Hood: The Panto! 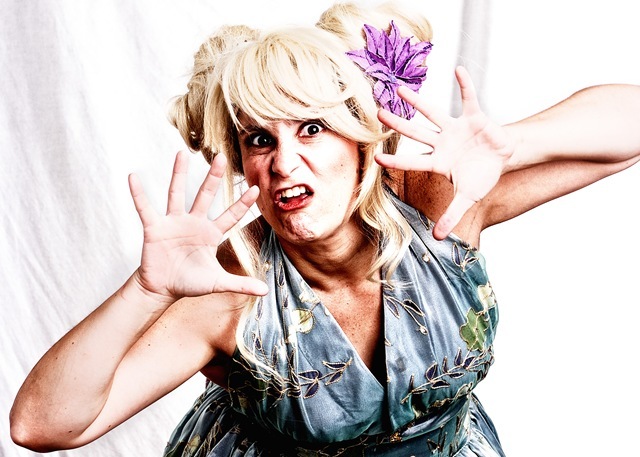 is the newly-minted creation of young playwright Jessica Puller, who authored their successful last year’s panto, Perseus and Medusa: or It’s All Greek To Me (our review ★★★). You’d better not expect something like the Ridley Scott or Kevin Reynolds’ versions of the Robin Hood legend—Puller takes a nice big swipe at those. No, in this version, Robin Hood (Berner Taylor) looks hot in fishnets but has a head the size of a watermelon from all the hero worship he gets from fans and the media. An eager overreacher, Scarlet (Nicole Keating) just wants to be part of Robin’s Merry Men but Robin, Little John (Adam McLeavey) and Alan A Dale (Maxx Miller) never cut her the slack to let her join. Of course, it’s tough when one is constantly outshone and out-thieved by Philip, the Cow (Vanessa Hughes and Amy Gorelow). Rescuing the lovely Maid Marian (Kaitlin Chin) from the deliciously sinister and effete Sir Guy of Gisbourne (Ben Muller) is a weekly event, but this time a trek to The Dark Forest leads Scarlet to discover a magic spell book by which she can rewrite events as she wills. Other memorable moments include Noah Ginex’s magic scene and puppetry design, as well as Vanessa Hughes and Amy Gorelow playing the evil spirits of the Dark Forest, busting out a power ballad just like the 1980’s duo, Heart. But the show really is about the pact between audience and players to have a ridiculous, raucous good time. To that end, bring your friends and family. And watch out for the whipped cream. This may be the worst of all possible times to be a banker, broker, or “master of the universe.” Masters of disaster, more like it, since the economic crisis has revealed as never before what a house of cards our financial system has been, what a gambling den deregulation has turned the stock market into, and furthermore, what a perfidious and ineffectual democracy we have in its wake. 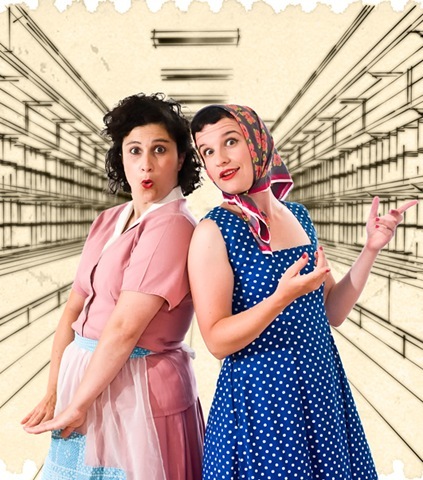 Into the fray comes Piccolo Theatre with its ribald production of Low Pay? 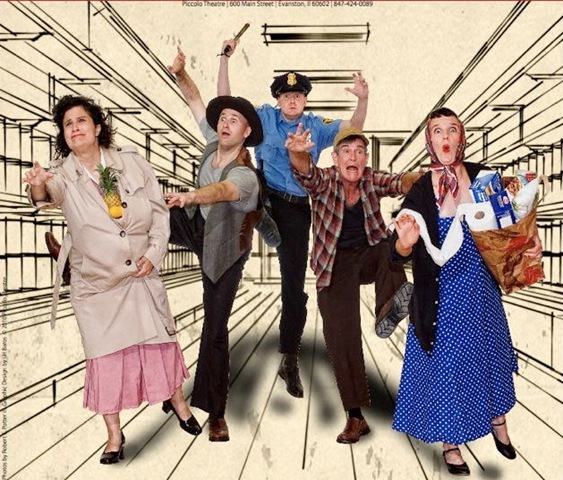 No Pay!, a slapstick comedy by Italian playwright and Nobel Prize winner Dario Fo. Be prepared for Italian socialism on the rocks. Director John Szostek and cast certainly rock it till it pops. Of course, if you’re a Tea Partier or Rush Limbaugh or you still think that unregulated capitalism is the only cure for what ails us, this may not be your kind of comedy. No, it’s a play for taxpayers looking for a little comic revenge against the capitalist system, even if they’re not so sure about the alternatives. Come one, come all! –to Dario Fo’s manic festival of jibes against financial shell games, irresponsible political parties, battling ideologies and the hysterically desperate tactics of the working poor trying to survive. Oh, and let’s not leave out slams against religion. 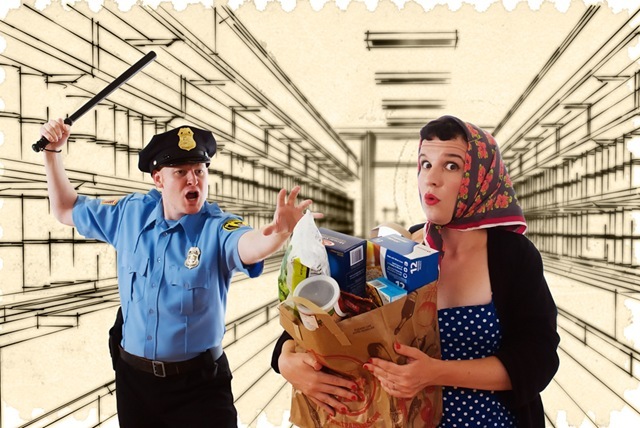 Antonia (Brianna Sloane) and Margherita (Amy Gorelow) return home to Antonia’s apartment, laden with groceries. Antonia has just stolen them in a shoppers’ rebellion from the local supermarket. Prices have escalated to twice as high as in the last month and the working class Italian housewives aren’t taking it anymore. Since a riot has broken out and Antonia and Margherita have gotten away with some of the booty, Antonia has to hide her stash before her law-and-order working class husband, Giovanni (Ken Raabe), gets home. Margherita stuffs her share of food under her coat, creating an all-too-noticeable bump that Giovanni can’t help but notice when he comes home. Antonia lies to her husband, telling him that Margherita is pregnant. But Giovanni cannot understand why his friend and co-worker Luigi (Glenn Proud), who is also Margherita’s husband, would not tell him about the coming baby. Antonia covers further, by saying that Margherita has been hiding the pregnancy from Luigi. And so it goes. The lies build up, both on Antonia and Giovanni’s part, and the hilarity ensues over characters trying to maintain them. Old formulas, tried and true–but, still, congratulations to Szostek’s well-honed cast. Prepare to see pairings as classic as Lucy and Ethel, Rickie and Fred or, for the guys, Ralph Kramden and Ed Norton. In American terms, Low Pay? No Pay! is “I Love Lucy” meets “The Honeymooners” meets Inspector Clouseau—only this Inspector (David W.M. Kelch) is Italian, is a bit quick with the handcuffs and his mustache keeps falling off. Ken Raabe reprises his role as Giovanni from Piccolo’s inaugural production. His confidence and expertise with the role shines through. 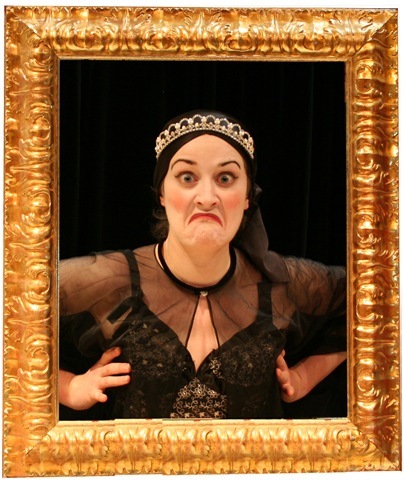 Amy Gorelow’s frustrated and run-around Margherita is a delightful, sweet gal pal to Sloane’s chatty and devious Antonia. Kelch does yeoman-like work in four different roles—my favorites were his Undertaker and Old Man. Proud’s performance as Luigi is as nice a prole as they come. Joel Thompson brings up the rear with his turn as the Inspector’s assistant police officer; only his comic timing could use some refining. Thank goodness he really sells the officer coming out of the closet. Goofy, good-natured fun is the key to Szostek’s direction. As much as upper class institutions and their political lackeys get their comeuppance, the whole cast keeps the comedy light, silly and fast-paced. Lucky for them, the playwright allows changes in his material in order to keep up with our current events. Only the play’s ending doesn’t translate so well from its Italian origins. That’s because Italy’s social and political reality is not ours; its modern cultural creations could never be an easy fit for Americans who don’t know their history. All the same, these last 10 minutes are more than forgivable for a full two-hours of comic revenge. Piccolo’s revival is well worth that. 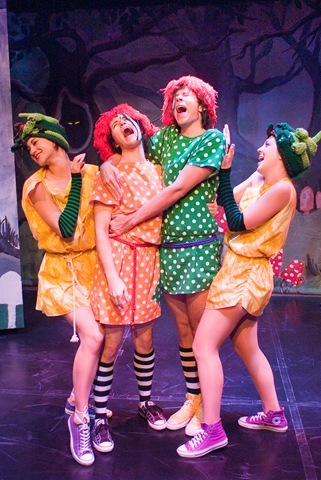 For reservations call 847.424.0089 and mention “Theater Thursdays” or visit www.piccolotheatre.com. Though its been more than 500 years since his rule, England’s King Henry VIII still ranks in the minds of many as one of the most boorish and misogynistic men to ever hold the title of head of state. That’s saying something considering we live in a world that brought us the likes of Attila the Hun, Ivan the Terrible and Adolph Hitler. Yet unlike these other wretched men, there’s always been a bit of a whimsical fascination with Bluff Harry from Herman’s Hermits’ “I’m Henry the VIII, I Am” to Piccolo Theatre’s production of Six Dead Queens and an Inflatable Henry. 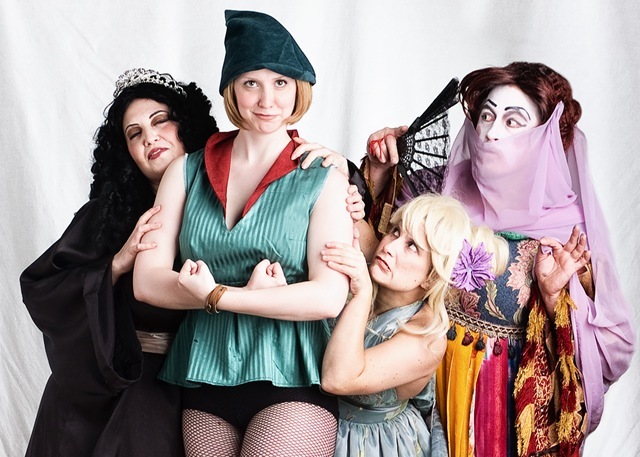 Originally created by the women of Foursight Theatre in the UK, Six Dead Queens is one part cabaret, one part biography and a whole lot of comedy. It stars the six unfortunate wives of King Henry VIII all forced to spend eternity at a sleepover. Like school-age girls at an overnight, they talk about boys—or rather one particular boy—while poking each other with catty jabs—sometimes in the form of words and sometimes in the form of swords. The opening scene sets the tone perfectly. As all the women lie concealed under the covers, the silence of the moment is broken by a well-paced series of flatulent outbursts. This dashes any worries that we’re about to be bored by a heady academic romp through history. Next, each queen is introduced through song. There’s the spicy Spaniard Katherine of Aragon (Amy Gorelow), the beheaded Anne Boleyn (Dani Bryant), little-miss-perfect Jane Seymour (Brianna Sloane), dumb and ugly Anna of Cleves (Leeann Zahrt), the promiscuous Kathryn Howard (Nicole Keating) and the motherly Catherine Parr (Denita Linnertz). The actresses’ multi-part harmony is impressive as is their adeptness with instruments. This talent enhances the humor. What could be funnier than watching the very serious Katherine of Aragon bang out a bass line on an upright? Characters squabble with one another in catfight fashion. Katherine of Aragon and her successor Anne Boleyn, whom the King tried to court behind Katherine’s back, row as do Boleyn and her successor Jane Seymour, whom bore the King his only son, Prince Edward. There’s also ample ganging up. Anna of Cleves gets it the worst, bearing the reputation of being ugly and foul smelling. Her marriage with the King lasted a brief six months, which in the judgmental eyes of the other ladies, makes her inferior. The play lacks any sort of cohesive plot. Instead, it plays as a series of monologues, musical numbers and sketches. It’s effective for about an hour. But by the end, Six Dead Queens runs out of any new ground to cover. The actresses all deliver outstanding performances. Through vocal inflection, mannerisms and personality ticks, the women bring to life six unique individuals with completely separate personalities. In addition, the roles call for a sweeping spectrum of dispositions from slaphappy to somber. 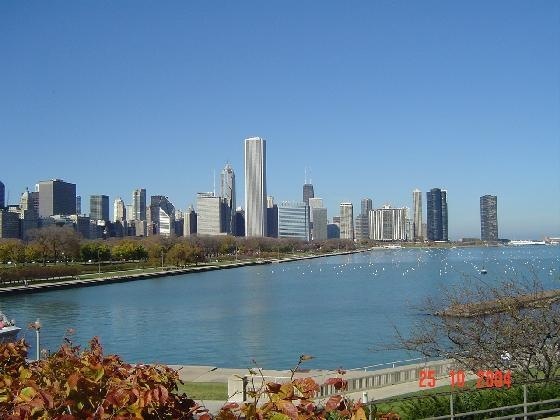 The performers are able to make the switch effortlessly. 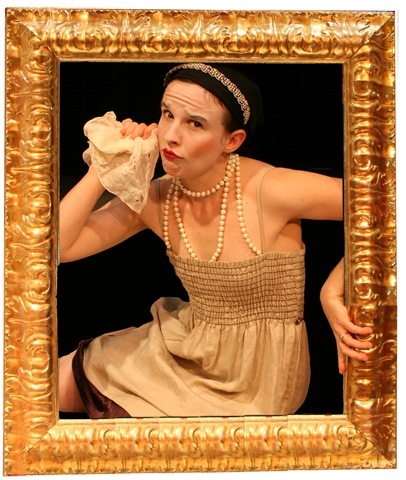 Six Dead Queens is an entertaining intersection of academia and vaudeville. At times uproariously funny, at times remarkably sad, the piece successfully explores how competitiveness can make women their own worst enemies, how comfort can make them their own saviors and how men can be pigs. 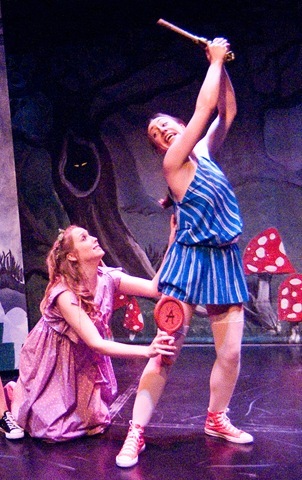 Children’s play best-suited for adult audience. Perseus and Medusa: Or it’s all Greek to me! 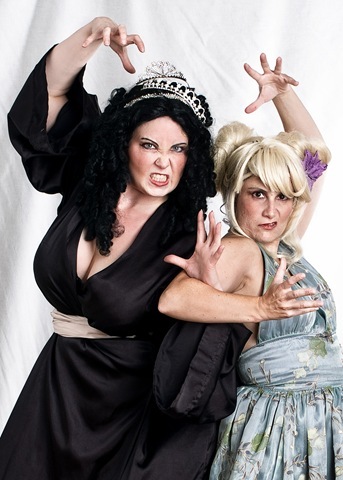 Piccolo Theatre’s new holiday panto, Perseus and Medusa: Or it’s all Greek to me!, is a hilarious parody of the well-known Greek myth about a young, boyish hero who must slay the vile Medusa out of a sense of duty. 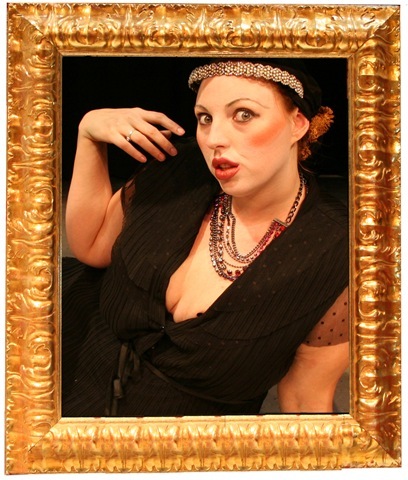 The slapstick-filled production plays like a bawdy cabaret, with sexual innuendo and gender-bending peppering the piece. Adults will definitely get a kick out of the humor, which includes a character whose name sounds like a part of the female anatomy. However, much to their dismay, their children may also get a kick out of these same antics, which often are too low-flying to be over even an 8-year-old’s head. This isn’t to say there is something negative about the baseness of the humor of the play. The original script, written by Northwestern alumni Jessica Puller, is self aware enough to make both the blue humor and the eye-roll-inducing puns entertaining. Its brashness itself is a joke, almost nudging the audience as if to say, “Can you believe we just said that?” This is especially true in a moment where the Dame, a clownish character played by a cross-dressing Andrew Roberts, is collecting dragon snot in a bucket with the plan to sell it as a face cream. Once a bucket is full, she remarks, “It would take me a month to fill that myself.” Although children might not understand, the adult’s in the audience know, we have ceased discussing dragon snot. And although the piece really is a vehicle for a string of off-color jokes, there is a plot. The liberal retelling centers on Perseus (played by female ensemble member Liz Larsen-Silva), a young boy who just wants to fish. The center of town is the bait shop/hair salon, run by juvenile Linus (Dominic Furry) and Evander (Maxx Miller). 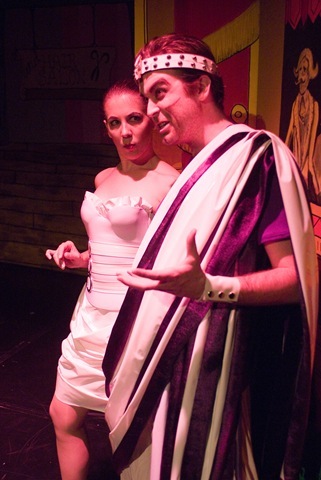 The evil king (Vic May) and his daughter Andromeda (Laura Taylor) enter the picture, and, upon first sight, Perseus falls for the princess. In an effort to win her heart and at the request of the King, Perseus sets out to collect the head of Medusa, the mythical villainess whose mere glance turns men into stone. The play is separated by an intermission, with the first half dragging on longer than necessary. But overall the script’s pacing is good, though it might cause younger children to squirm in their seats. The acting is solid, with no weak links in the cast. 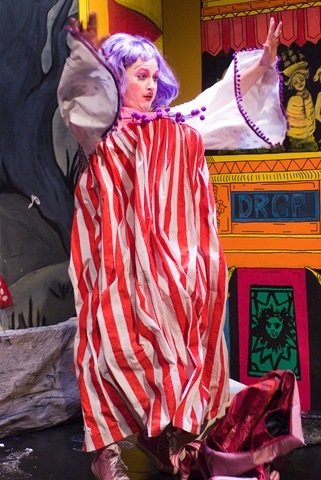 Roberts delivered a stand-out performance in his role as the clownish Dame. His fluctuating falsetto and wild hand gestures were belly-achingly funny throughout. Ensemble members Glenn Proud and Brianna Sloane shared directing duties, balancing the cast of more than a dozen so that the production never felt cluttered. Their talents really shine in the fight sequence between Hermes and the villainess Nestor (ensemble member Deborah Craft), which is a well-orchestrated example of stage combat and puppetry. 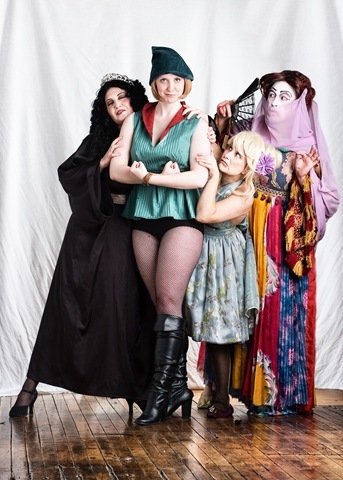 Perseus and Medusa is a fun, fanciful play, but be warned: this children’s theater production might be a little too risqué for its intended audience.